Remembering all the Income Tax Section 80 Deductions is no mean task. There are such instances where students get confused with one section number with the other section numbers. This leads to much bigger problems. 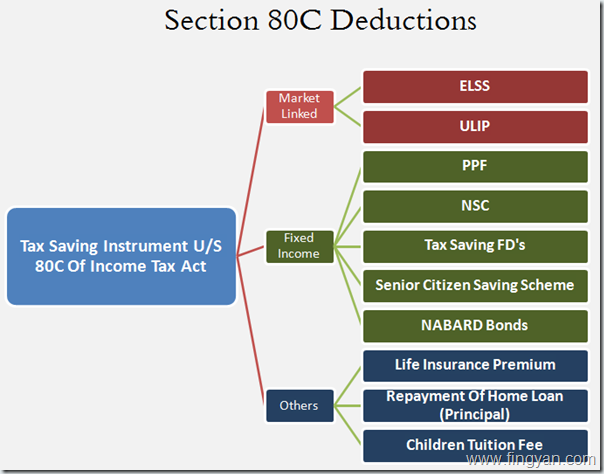 To solve this confusion to some extent, We are providing the list of Section 80 Deductions along with the Mnemonic code to remember them. 80GGC gadhe ghode (donation to politicial party) charao by foriegn co.
Rs.1,50,000 Deduction for the above two. Deduction allowed in Initial Assessment Year and 7 preceeding years. 50% and 100% in different cases. Actual contribution is allowed as deduction. 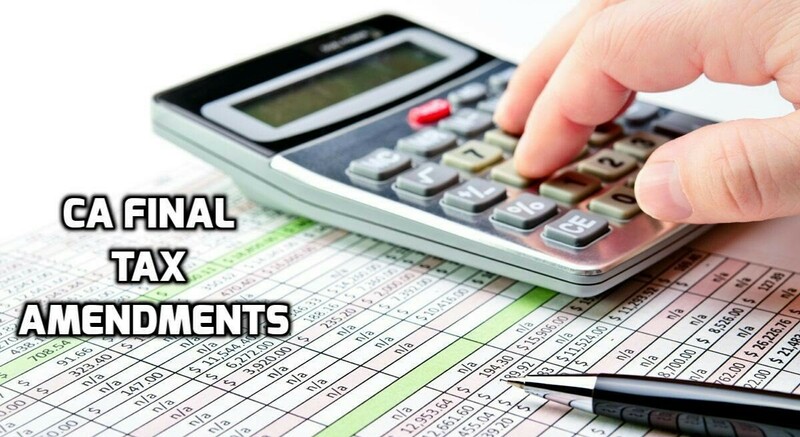 Least of Amount received or Rs.3,00,000 is allowed as deduction. Rs.75,000 for normal disability and Rs.1,25,000 for severe disability. As Part of CA IPCC Law. Notes Edition, Entire Gratuity Act has been provided as a 3 Minute Summary for quick revision before exam. The Entire Chapter has been explained with simple language and easy examples. # The Act applies to every Factory, Mine, Port, Railway Company and Establishments employing 10 or more people. # The Act applies to Temples also [Shree Jagannath Temple Vs Jagannadh Padhi]. Gratuity shall be payable to employees who have worked for straight 5 Continuous Years in an organisation. > 190 days (if the employee is working in an underground Mine, or if the organisation works only 5 days a week). > 240 days in any other case. For Example: Mr.Ramesh is working in Google. Google works only from Mon to Friday. So, For the last year, Ramesh must have actually worked for at least 190 Days to say that he has worked for One Continuous Year. In case of Seasonal establishments, an employee is said to have worked for One Continuous Year, if he has actually worked for at least 75% of total working days of that Seasonal Establishment. For Example, Mr. Vikram is working in a Fire Crackers Factory in Nagpur. Last Year, the factory has run for only 140 days. So, Vikram is said to be in work for One Continuous Year if he has worked for at least 98 days (75% of 140 days). accident, and was re-employed in the same organisation for reduced wages, Gratuity shall be calculated twice. Once, up to the date of accident with that salary and Second, For the period subsequent to the disablement. For Example: Mr.Vivek is a Manager in Reliance. He is drawing a salary of Rs.1,00,000 for the past 10 continuous years. On Jan 1st, 2014 he met with an accident and lost both his legs. Reliance re-employed him for a Clerk Job for a Salary of Rs.25,000. Vivek is retiring today. So, Gratuity calculation shall be made twice. Every employee who has completed 1 year of service, is compulsorily required to make a nomination. The nomination must be made within 30 days of completion of one year of service. If an employee has a family at the time of making a nomination, the nomination shall be made in favour of one or more members of his family, and any nomination made by such employee in favour of a person who is not a member of his family shall be void. 1. For Companies and Firms, it is compulsory to file Return of Income. However, for others, Return shall be filed only if there is a taxable income. 2. Indian Resident who is a owner or beneficial owner of an asset situated outside India shall also file a Return of Income. # After these due dates, a person can still file a Return which is called a Belated Return. A Belated Return shall be filed, before end of that AY, or before the completion of Assessment, Which ever is earlier. # If a Return is filed after due date specified above, Interest @1% each month has to be paid. Income of Political parties can be exempted under section 13A. To claim this exemption, such political party has to file a Return of Income. Such Return will be signed by its CEO. Every Person whose total income is more than basic deduction limit (and )Person carrying on a business whose gross receipts exceeds Rs.5 Lakh, shall apply for a PAN. Purchasing a Motor Vehicle, Opening a Bank Account, Applying for a Credit Card and Opening a Demat Account. Payment exceeding Rs.50,000 for Hotel or Restaurant Bill, Foreign Travel Agency, Mutual Funds. # Where a person, entering into any transaction referred to in this rule, is a minor and who does not have any income chargeable to income-tax, he shall quote the PAN of his father or mother or guardian. 22. Works like Polishing Diamonds, textile processing etc. CA IPCC Company Law Amendments for May 2017 are quite high in number this time. Companies Act, 2013 has been amended many times for the past one year, which has led to bringing in new amendments in the IPCC Law paper. So, In this post, we will cover only the amendments in Company law portion. The Amendments listed out below are applicable only for May 2017 CA IPCC exams. There are total 27 Amendments in the Company Law portion. However, out of these, only six are applicable at IPCC level. Amendments have been brought in almost all the topics like Deposits, Company Basics and General Meetings. Public Companies now need to file a Declaration with SEBI and RBI (Only Certain Companies) and obtain approval at the time of filing the Incorporation Documents with the ROC. Earlier, there is no such rule to get the approval. Minimum Capital Requirements of Rs.1 Lakh and Rs.5 Lakh removed for Companies. Now Public and Private Companies don’t have any such Minimum requirement. In case of any Contravention in Accepting Deposits from Public, Companies now need to pay a Minimum fine of Rs.1 Crore and a Max of Rs.10 Crore. Notice period for Section 8 (NPO) Companies for General Meetings reduced to 14 days. Earlier it is 21 days. A Company need to serve documents only on such members who are holding at least Rs.1,000in face value of shares or 1% of total paid up share capital. Earlier, a company is bound to serve documents to all the members. When a company goes for further issue of Share Capital, an Ordinary Resolution has to be passed. Earlier, it is SR. Section 99: Punishment for default in complying with provisions of this section. There are few other minor amendments in the Companies Act, which students can totally ignore, as these will be asked in CA Final exams only. Students must put stress on these amendments because, most of the questions in November 2016 and May 2017 exams will be based on these amendments only. Many Toppers of CA IPCC exams has mentioned in their interviews that, at least 20 marks will be asked in exams from these amendments only. ICAI President, has also mentioned the same in the recently concluded National Convention for Students. 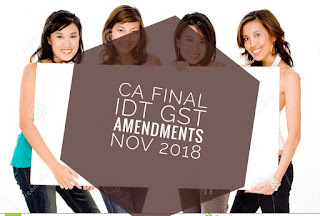 The best books to study these Amendments is ICAI Practice Manual. ICAI has been asking direct questions in Law paper from Practice Manual only.